This guide will provide you with instructions as to how to configure the WooCommerce Shipping features available in your WooCommerce store. Besides, this will also give you an idea about extending your shipping functionalities so as to make your shipping more robust and efficient. Have you ever wondered, why shipping rate calculation is important..? Well, according to a report, unexpected and high shipping rates is the major cause of cart abandonment. Hence, in order to avoid this, shipping rates must be calculated in such a way that the customers can feel comfortable paying the extra amount. One of the best ways to do this is to make sure the shipping calculation is transparent. Doing so will help the customer avoid any unpleasant surprise while placing his/her order or from abandoning the cart. Free Shipping, as the name suggests, would result in no shipping charges on customers orders. You can use Free Shipping using a coupon, or by defining a minimum order amount or both. One of the most practical uses of free shipping is as a business strategy in order for customers to spend more. For instance, the store owner can offer free shipping on orders over a particular value. However, since Free Shipping a write-off that store owners have to incur between their profitability and providing customers with a good experience, it has to be employed very prudently. Flat rate is a rate that is fixed for an individual zone or multiple zones. A set of complicated mathematical calculations are normally used in order to arrive at this rate. For example, you can charge customers either based on charging 10% of the overall order cost or on the number of items in the cart for shipping. For WooCommerce users, there are many commercial and free shipping method extensions that are available to help you to perform some simple as well as complicated shipping calculations. These plugins can be downloaded from the WordPress plugin repository or from commercial plugin developers. These plugins help you to fix a shipping rate for your products based on various parameters. These include product weight, dimensions, shipping destination, and order quantity and other parameters like the type of product. This is in case the product requires special care while shipping, like for breakable, perishable, corrosive or antique products. This shipping method allows you to have different zones set-up for different countries, states, and zip codes. You can also create multiple rate tables within the zones. Each zone will permit you to define the shipping boxes used for packaging and will include length, breadth, and height along with weight restriction. The rates can be configured based on a fixed rate, percentage, and rates based on the weight of the order. Those items that are then ready to be shipped will be packed into boxes, based on the volume of the contents. The rates can be offered as a standalone shipping rate (in case of per product shipping) or added to other shipping method rates. There is a list of products with a fixed shipping cost while for the remaining it varies depending on the product. In this shipping method, you can define locations where you will offer local pickup at optional costs. This shipping method provides real-time or live shipping quotes. Here, rates are obtained from a third party Application Programming Interface (API), for shipping carriers like USPS, DHL, UPS, Canada Post, Australia Post, and FedEx. Most of these carriers support box packing or providing rate quotes per product. They can be customized to show multiple rates or the cheapest rate. Base Location: Select the location from where you are shipping your orders. In the example above, we have selected the United States (US) – Indiana. No location by default: Here, the store owner does not set any default location, and hence no taxes are calculated. Shop base address: In this option, you can set the base location of your store as the default customer location. Geolocate: Selecting this option enables you to determine the customer’s default location based on the IP address through which the customer logs in. Geolocate (with page caching support): As in the previous option, here also, you can determine the customer’s default location based on the IP address through which the customer logs in. The only difference is that you have to select this option only if your store has a page caching support. After configuring the settings mentioned, you can Save Changes. There are three sections under the Shipping tab namely Shipping Zones, Shipping Options, and Shipping Classes. The shipping zone(s) can be selected based on where the store owner wants his/her products to be shipped. Multiple zones can be added based on the location. Naming the shipping zone(s) can be done based on the store owner’s preference. After selecting the zone, you can select the regions within that zone where you wish your products to be shipped. For example, for the zone USA, you can select particular states or postcodes in the USA where you want your products shipped. Alternatively, you can select United States for shipping your products across the USA. 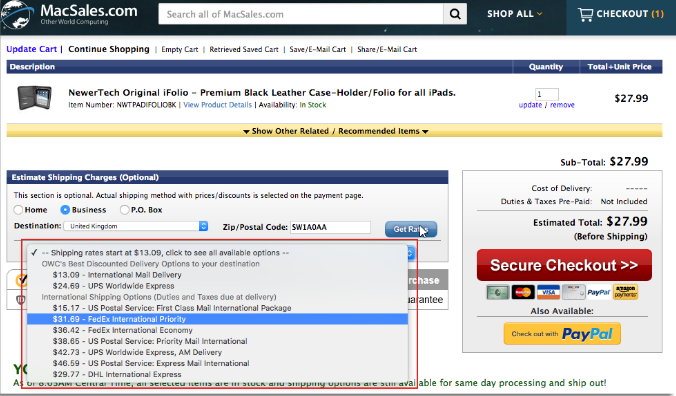 After selecting the shipping zone and shipping regions of your choice, click on Save Changes. This will enable you to select the shipping methods which are applicable to that particular zone and region. Once you have added a Shipping Zone, you can select the Shipping method(s) which are relevant to that shipping zone. The shipping methods you select from a shipping zone will be applicable only to customer’s addresses within that particular shipping zone. Located in the sub-menu of Shipping, Shipping Options enables the user to configure the availability of the Shipping calculator on the cart page or only when an address is entered in the Ship To field in the store. The user is also able to configure the default Shipping Destination. In this option, the customer is able to view the shipping rate of his/her order only after he/she enters his address while checking out. In this case, only the customer’s billing address is asked for, and this is, by default, taken as the customer’s shipping address, with no option to change it. Enabling this option will allow you to debug any shipping related issue that may arise because of the shipping zone mismatch. Method Title: This will, by default, appear as Flat Rate. Otherwise, enter Flat Rate in the corresponding box. This will reflect in the Cart/Checkout page of the store under Shipping Options. None: This option specifies that the Shipping costs will not include taxes. These costs can optionally be added based on the costs you wish to specify for the different product shipping classes you have created. This section will appear only if you have configured different product shipping classes in the store. Here, store owners have the provision to set specific shipping costs based on the Shipping Classes they have added. The shipping costs set for the shipping classes will be added to the flat rate which would have already been defined. When the shipping rate is calculated for each of these classes, the flat rate will be added to the shipping class cost of each shipping class to arrive at the actual shipping rate. If the product being shipped belongs to a class that has not been defined, then you can set a shipping rate that has not been entered under any shipping class. This cost is set in the No Shipping Class Cost. Setting shipping class costs can be done based on the preference of the store owner. Per Class: Charge shipping for each shipping class individually: In this option, the shipping cost will be calculated individually for each shipping class and its cost. The total shipping cost will be the sum of each individual shipping class cost according to the items in the order. Per Order: Charge shipping for the most expensive shipping class: In this option, the most expensive shipping class will be used for calculating the shipping costs. Title: This will by default appear as Free Shipping. Otherwise, enter the title Free Shipping. This will reflect in the Cart/Checkout page of the store under Shipping Options. A valid free shipping coupon: In this option, customers have to provide a free shipping coupon to avail the free shipping service. Free shipping coupons are generally provided by WooCommerce store owners as part of a marketing strategy. A minimum order amount: In this option, the order should meet the criteria of a Minimum order amount for the customer to avail of free shipping. A minimum order amount OR a coupon: In this option, the customer has to meet the criteria of either a minimum order amount or a free coupon to avail of free shipping. A minimum order amount AND a coupon: In this option, the customer has to meet the criteria of both a minimum order amount as well as a free coupon. Minimum Order Amount: If any of the latter three options are selected, an extra field appears which requires the store owner to enter a minimum amount for which a customer can avail free shipping. Now click on Save Changes, to save the settings made. Title: This will by default appear as Local Pickup. Otherwise, you can enter the title Local Pickup. This will reflect in the Cart/Checkout page of your store under Shipping Options. You can now click on Save Changes to save the settings made. A Shipping Class is a group of similar products to which you can add a separate shipping cost. In the same way, you can create multiple shipping classes and add shipping costs for each shipping class. Any change you make in the shipping cost of that class will reflect on the shipping rate of all products in that class. Shipping rate methods such as Flat Rate Shipping and Table Rate Shipping will enable you to set shipping costs for products in a particular shipping class. 1. Click on the tab Add Shipping Class to add a new Shipping Class. 2. Add the Shipping Class name under the Shipping Class column. 3. Add a Slug, which can be the shipping class name itself or something similar. 4. Under Description enter something about the nature of the Shipping Class. 5. The Product Count denotes the number of products under a particular shipping class. Consider the case where products are already added. Choose the Product that needs to be assigned to the appropriate Shipping Class. Assign rates to particular Shipping Classes as shown below. Assign the Shipping Class to the Parent product. Access the Product Data tab by scrolling down on the Product page. Now select Variations from the left panel. Choose the variation the Shipping Class needs to be added to. Am I charging my customers too much or too little for shipping..? Should I offer Free Shipping..? Would I still make a profit if I provide Free Shipping..? These are some of the typical questions most WooCommerce store owners ask themselves while formulating their shipping strategy. Getting your product into the hands of your customer in a way that delivers a truly exceptional customer experience, while keeping you profitable, is very important to business success. Here, we will try to list the most popular shipping scenarios and guide you about how you can set this up in WooCommerce. To remain competitive in today’s marketplace, you may be forced to offer Free shipping. Free Shipping has a very positive effect on conversion rates, is easy to explain to customers and also aligns with customer expectations. It can be a good selling tactic to offer Free Shipping. But you should keep in mind that, Free Shipping may be free to your customers but not to you! Understanding this, some businesses offer Free Shipping, but they slightly increase the prices to cover the shipping cost. But if you choose to offer free shipping in its true sense, it is very important to understand its impact on your business’ bottom line. You will still need to pay the carrier and make sure you’re making enough on each order to cover the associated shipping costs. The most effective approach to Free Shipping is to only offer it for orders where you know you’re making enough on the sale to cover shipping and still make a profit. You could try offering Free Shipping with a minimum order amount or a minimum number of items that makes sense for your business and, maybe try excluding products that are too heavy or bulky for you to offer Free Shipping. A common rationale for offering Free Shipping is that it will help boost sales, leading to more orders and more profits. Free Shipping can also lead to larger orders, particularly when minimum thresholds are applicable. This should drive up your average order value and help you have more margin to apply the shipping cost against. Free Shipping based on order amount or country can be set up using the standard WooCommerce shipping method, Free Shipping. But if you need to offer Free Shipping to specific products, based on a number of products in the cart, etc., you may need to use plugins that allow more complex shipping rules. A very commonly used plugin is the Table Rate Shipping plugin. Free shipping on selected items for orders of $100 or more. Free shipping on more than 10 items. Free Shipping on books and Flat rate on other products. Another option to consider, while deciding on your shipping strategy, is to offer a Flat Rate for every package. Flat rate shipping works best for businesses that sell products that are fairly small and not too heavy or products that are similar. This eCommerce shipping strategy is as popular as Free Shipping, as it keeps things simple for customers and it’s easier to set up on the website. Flat Rate method of charging for shipping requires you to figure out your average cost of shipping a package. This is anyway a best practice that you should be doing to make sure that you don’t drastically undercharge or overcharge your customers. When you charge a flat rate, you’ll probably be slightly overcharging or undercharging your customers than the actual shipping cost. This means you’ll lose money on roughly half of your shipments and make money on the other half. But it all evens out in the end. If you have products that vary significantly in weight, it might be a better idea to go for Weight Based Shipping. For example, if you sell shoes, jackets, and dresses, a one size fit all Flat Rate shipping option may not work as there is a large weight (and price difference) in shipping a pair of shoes compared to a light summer dress. Charging different shipping rates based on weight slabs is common in such scenarios. Beyond the defined range, you can define the shipping rate per weight unit. To figure out your shipping costs you need to actually calculate them by measuring their weight, dimensions, and other factors that affect how much it costs to ship them. Round these numbers up to the nearest whole number. Calculated shipping is the most exact method to make sure products are priced correctly. In some cases, it is not that simple. You may want to add one more parameter along with weight, for eg. regions. If you want shipping prices to be different based on weight and country or region, then you may try Table Rate Shipping. A common requirement is to set shipping cost based on the order quantity or order total. For example, you are selling shoes weighing roughly 1 kg, and usually, charge $3 each for shipping. You could offer a shipping discount of say 25% for orders of 3 or more shoes up to a maximum 6. This means that if someone buys 4 shoes, the total shipping cost would be $9 instead of the original $12. This is an example of setting shipping cost based on the Cart or Order Quantity which is ideal if you sell multiple items with identical weights or prices. You could similarly set shipping cost as a percentage of the total amount in the cart. It is also a common strategy to offer Free Shipping if the cart subtotal is above a certain amount. For example, you can offer Free Shipping for any order value of $100 or above. These kinds of complex shipping rules are not available in standard WooCommerce. You need to install separate WooCommerce add-ons for implementing such rules. With Advanced Shipping extensions for WooCommerce such as Table Rate Shipping plugin, you can set up shipping rates based on a variety of conditions based on the Cart. WooCommerce product shipping classes or product categories can be used as a way of setting shipping cost for a group of products. For example, products in category Books can have a different shipping rate than those in category Furniture. Similarly, products associated with the shipping class small may fit into an envelope and those associated with shipping class large may require a parcel shipping. You may define different shipping calculation methods for these classes. You may use the WooCommerce Flat Rate shipping method to associate a flat rate to the shipping class small and use Table Rate Shipping method to set a weight and region based rates for products with shipping class large. The one-size-fits-all solution may not be suitable for all types of products. If your store is selling one-off, heavy or large products that require additional shipping, unlike the rest of your catalog, general pricing, based on weight or order amount may not be practical. For example, a shop owner who is selling antique items may need to take special care and do specialized packaging and want this reflected in the shipping price. In such cases, you may need the option to set up a separate price for each item in your catalog. The WooCommerce system then adds the per-product shipping fees together to provide a total at checkout. Apart from including cost per product, you also have the facility of defining costs per variation of the product. If you have a physical store, you can let your customers order products online and choose to pick up at your store to avoid shipping costs. You can still charge customers a handling fee if you wish to. Local Pickup option is available out of the box in WooCommerce and allows you to configure a local store in any destination you wish, from which customers can pick up the products they have ordered. This sets the geographical perimeter for which customers can pick up their order. However, for some businesses, local pickup requirements could be a bit more complex than just setting the pickup zone and handling fee. Again, there are plugins, such as WooThemes Local Pickup Plus, that could meet most of the complex requirements. Charging what you get charged by your shipping courier is another great eCommerce shipping strategy if you prefer to offer the best possible shipping rate to your customer while still covering your shipping costs. There are WooCommerce add-ons that let you get live rates in real-time directly from carriers such as UPS, USPS, FedEx, Australia Post, Canada Post or DHL. Once a customer gets to the Checkout page and selects where he/she wants the order shipped, the calculator pulls the available services and corresponding real-time shipping quotes from the shipping service provider by calling the right API. Using a real-time calculator can help you win the trust of customers. It shows that you are not inflating your shipping charges. Customers may also choose the best shipping service that matches their budget and delivery speed requirements. With the right plugin installed, the store owner, can also pay postage online and print shipping label without leaving the WooCommerce admin interface. This could save a lot of time and effort in shipping your package. At times, you will have complex shipping requirements which need a combination of calculation methods. For example, you provide Free Shipping in your home state but charge Flat Rate for other states in the country. For shipping to international destinations, you charge weight based shipping rates. You have assigned a shipping class for certain items for which you want to charge a Flat Rate. There could be more requirements in real life scenarios. If you have complex and advanced shipping calculation requirements, you may rely on the Table Rate Shipping method for WooCommerce. Table Rate Shipping method gives you great flexibility for nearly every scenario. WooCommerce Table Rate Shipping method is arguably the most powerful and flexible shipping method available for WooCommerce. This lets you define rules and set a corresponding shipping rate for a combination of conditions. You can define shipping rates based on the shipping destination, have multiple rates per zone, and add multiple rules based on product weight, cart subtotal, the number of items, shipping class, price and so much more. If the user’s cart matches the rule, the shipping cost you defined for that rule is applied. Bundle Rate shipping rate is commonly used in shops where customers buy multiple products of similar type. For example, you have set a flat rate for Per Product Shipping but wants the Cart to automatically charge the same flat rate per multiples of 5 of the product. So, for instance, if the customer orders 1–5 items, the cost will be $1.00, but if the order is 6–10 products, the shipping will be $2.00 and so on… so it will add an additional shipping fee for every 5 items ordered. This kind of special bundle shipping rates can be configured using Bundle Rate shipping plugins. Another similar requirement is to offer free shipping for one product when purchased along with another. Whether you’re a big or small WooCommerce shop, shipping is a chance to impress or disappoint your customers. Processing orders in a fast and efficient manner are very crucial for an eCommerce business. As you grow, there are a variety of shipping plugins and tools that can further help you streamline your shipping processes. This includes simple plugins which will help you to print invoices, labels, receipts and packing slips or track orders. You can use plugins which will integrate with many of the most popular courier companies so that you can print more than just shipping labels but the postage as well, which will be directly charged to your account. It is generally a good practice to include an invoice and packing list when you are shipping a package. It serves as a confirmation of what the package contains along with your contact information and the details of the purchase. It also establishes an extra line of communication between you and the customer and adds a human touch. Furthermore, when you sell internationally, many countries require an invoice to be included. An invoice should contain all the required order details (such as name and address of your company, billing address of your customer, a list of all order items including taxes and totals). If you don’t include one, there is a possibility that their customs officials may assess a value to the items in the package which in some cases is higher than what the customer has paid. This means the customer has to pay higher import fees and you’ll end up having a very frustrated customer. 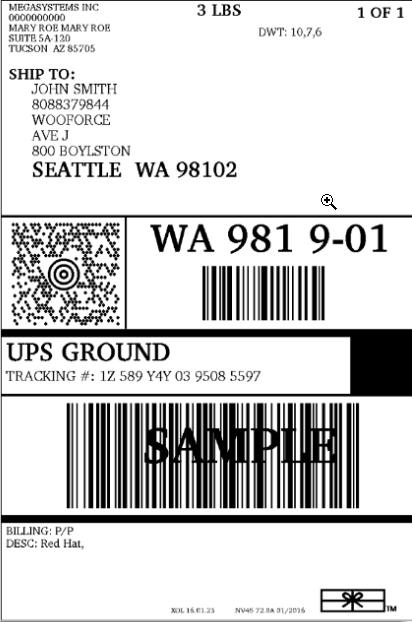 You may also want to print the address label with or without postage. If you have a business account with a shipping service provider, you can integrate your store with this account and pay the postage and print the label without logging into their online system. This helps to avoid copying and pasting the order and address details. Once you start shipping your orders, you will also start receiving emails and calls from customers inquiring about the status of their order. If you can reduce the number of customer emails and calls with these questions, you may save a lot of time and money! With WooCommerce default settings, customers receive an email with order details when they initially place an order, and the order status changes. Your store’s Checkout settings determine which statuses trigger a customer order notification email. You might want to add the order tracking information in one of the emails. Not handling order fulfillment yourself? You might either want to integrate WooCommerce into your fulfillment service provider or you will manually export your orders and send to them. If you are using StorePep, ShipStation, ShippingEasy, ShipWire, etc., there are free plugins available. If you are using a different fulfillment service, you might find an integration plugin in the WordPress repository or somewhere on the Internet. If you are not lucky enough, try talking to a developer. There are Order/Customer Import Export plugins available for WooCommerce that lets you export or import individual orders or bulk orders. This will be useful if you’re using an external shipping system or other third party software. You can also set automatic export via FTP, HTTP POST, or email for any or all orders. You can use this guide to set up WooCommerce shipping in your WooCommerce store. The WooCommerce Shipping plugins mentioned in this guide help users to achieve their shipping goals and includes features that help make the whole shipping process a lot simpler. You can contact our customer support if you need any help or have any doubts about the plugin. The team will help you through and out so you don’t have to worry. Do let us know in the comments how you feel about this article. We would love to hear from you. This entry was posted in Blog, Documentation, FAQ, Generic, Getting Started, Knowledge Base, WooCommerce and tagged how to ship, shipping guide, shipping tutorial, WooCommerce shipping, woocommerce shipping guide, woocommerce shipping tutorial.